@khaleesibot love that picture anyone hope the banjo will be added? Thanks for the update @khaleesibot ! This page makes the while three-week event look even more epic! I want all of those things. This is gonna be really cool. I really love the red and green sails. I need it! Hey there&apos;s a skeleton parrot on the link ! Maybe skeleton pets are coming ! @roughleech03117 I pray and hope the banjo is added. @khaleesibot lols great. Which items do you pay with doubloons and which are from gold? I&apos;m soooo excited for this content! @khaleesibot All of this looks amazing! The new cosmetics look great, and I&apos;m really excited for the time-limited campaign! Can&apos;t wait for July 31st! P.S. Sorry for the excessive exclamation marks! Is it wrong that I&apos;m probably most excited about hair dye? My beard will finally match my name! A nice old, grey, dingy looking beard. Goodbye, beautiful amber mane! Looking so awesome! I need that skull tankard! Hmmmm, new Legendary skins for me sleek gally…. SIGN ME UP RIGHT NOW!!! Can&apos;t wait for all this new content.... isn&apos;t it the 31st yet??? It’s going be a lot like Christmas! I can’t wait to spend my 2.25 million gold that I’ve been hoarding all this time! Can we have the brigantine early PLEEEEEEEEAAAAAAAASSSSSSSSEEEEEEE! With golden sprinkles on top!! And the figurehead that we saw! I&apos;m going to need more money. Will we still encounter skeleton ship armadas after the campaign? I know that skeleton galleons will appear but I hope there are still occasional armadas. Will the Bone Crusher stuff be bought with dubloons or gold? " Skeleton-themed items (such as the lantern and speaking trumpet), clothing accessories and instruments will remain for sale in shops for those who unlock them." Assuming we just have to unlock the ability to buy them from the store? If it is from dubloons only, I really hope there is more than enough to get them all. Everything looks great, but the skull lantern and skull tankard are pure wins. Fantastic!! Can we get Karnath and liars dice finally added? get a dev team working on a companion app that can support our sea of thieves account info and allow us to bet our gold against others. Also support suggestions don&apos;t even get pushed to the dev teams anymore? we have to put them up on the forms. they want to see the suggestions upvoted or they don&apos;t even acknowledge them..? what happens to all the ideas that would have made this game that much better. it seems like a p**s-foot attempt and making something great. 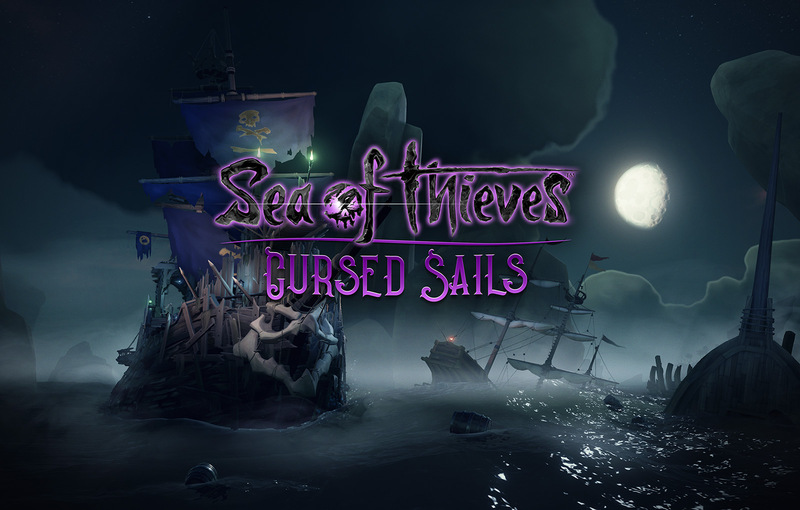 @khaleesibot "content update : Cursed Sails, is now live". I thought "Cursed Sails is now live!". I want to know one thing!! Can we control the skeleton ship? I would ditch mine for a skeleton one! @khaleesibot I like the pic. anyway I can use on my desktop?